A simply stunning remake of a gaming icon. This is an object lesson in how to remake a seminal game. Some games are just too good to die, but the ever-forward-looking games industry rarely sees them that way. Capcom, however, has bucked that trend in recent years, creating a string of modern-technology remakes of its sublime back-catalogue. Resident Evil 2, though, is the one everyone has been waiting for - and this exemplary remake most certainly does not disappoint. The starting point for a good remake has to be a great game, and there's no doubting Resident Evil 2's credentials in that regard. The 1998 original is generally held to be the finest of all Resident Evil games, due to its great origins-setting story and innovative narrative, which involved swapping between the perspectives of two characters - Claire Redfield and Leon S Kennedy - whose paths periodically crossed. It achieved the perfect blend of action and puzzling, infused with a delicious dose of horror all the way through. The 2019 remake not only preserves all those plus-points, but expands on them and adds new ones. It recreates the original storyline, but not in a slavish manner, expanding various elements of it and, most radically, reconfiguring it so that, instead of flipping between Claire and Leon, each character gets their own storyline, so you choose which one to play first and have another one to play through when you've finished. At times you get to play short sequences as supporting characters too. The original's story was great, but the remake's one is sublime. It provides a gloriously convoluted origins exposition for the franchise's familiar lore, documenting the evil Umbrella Corporation's initial misguided experiments with its mutant-generating G-virus, which lead to the inhabitants of Raccoon City becoming zombified or worse. Leon and Claire hook up at a zombie-infested gas station as the former makes his way into his first day's work at the Raccoon City Police Department. Slightly disappointingly, the first stage of their twin storylines is identical, involving working your way through the police station to reach its parking garage, but from then on (although there are sequences when they must solve the same puzzles) they diverge pleasingly. Cleverly, Capcom has ensured the two campaigns also feel different in gameplay terms, due to the characters' different attributes (Claire is more mobile, Leon more robust) and, especially, their weapon load-outs. Various enemies prove to be more challenging according to which character you're playing. Claire gets a powerful revolver which can only hold five bullets, a grenade-launcher which is great against enemies like Lickers, an automatic with a handy laser-sight and a submachine gun, whereas Leon has a highly upgradable handgun (which can fire three shots at once), a high-calibre handgun and the classic shotgun, for which ammo is in annoyingly short supply. Both characters get a knife to stick in zombies as they attack (which you can retrieve after you kill them) and a variety of grenades. Along the way, encounters with ever-more-fearsome bosses punctuate proceedings, and the chilling Tyrant - who is essentially indestructible - periodically appears, plodding intimidatingly in your direction to cause extra panic, especially when you're already beset with zombies. The boss-encounters are highly memorable, the bosses themselves deliciously gruesome to behold. Mechanically, the Resident Evil 2 remake picks up where Resident Evil 7 left off - which makes sense, since 2017's most recent instalment of the franchise represented a conscious effort to return to the roots established by the first three iterations. Although it doesn't go as far as imposing a first-person perspective; instead, it uses a behind-the-shoulder viewpoint which is spot-on (and more wieldy than the original's perspective). 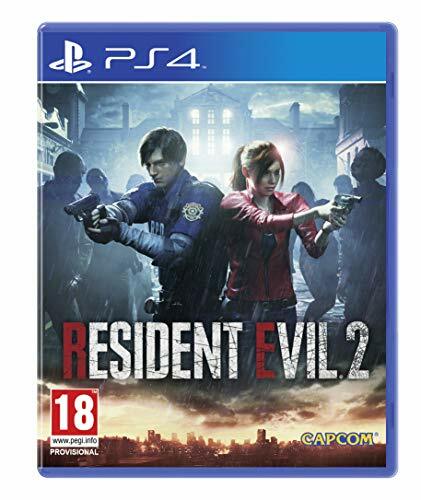 Like Resident Evil 7, Resi 2 it looks absolutely gorgeous, awash with squishy, slimy textures and possessing a graphical clarity which ramps up the horror elements to at times near-unbearable levels. If you played the original then get fired up the remake - it's like removing a net curtain from in front of the virtual lens. If anything, the expansion of Resident Evil 2's familiar settings leaves you even more obsessed with collecting every single object and solving all the puzzles - even those non-essential to advancing the storyline. Like the original, the remake is pretty hard and unforgiving - there will be times when you barely have enough ammo to survive, and must resort to tactics like collecting an object and running to the nearest typewriter to save, before making the next foray. And it pays to save often - it is possible to find yourself short of ammo in boss-battles, which is hugely annoying. A library of saves represents the only means of rolling back and harvesting more ammo when you know a show-down is around the corner. The original Resident Evil 2's horror dynamics garnered a huge amount of praise at the time. The 2019 remake makes the maximum use of modern technology to take them to an even higher plane. As a result the new Resident Evil 2 is an absolute tour de force - it's nothing less than an object lesson in how to remake an old game. It's every Resi fan's dream: a faithful but demonstrably improved fantasy-version of the finest Resident Evil game, which boasts production values that are bang up to the minute. If you class yourself as a Resident Evil fan, it's a must-buy. And if you're a horror fan who wasn't old enough for the original or just missed it then, well, you're in for an absolutely terrifying treat.